Adopt cloud storage from your critical SAP data to Amazon S3 in a secure, streamlined manner, simplifying IT architecture while still meeting storage demands of your critical SAP workloads. Learn how to integrate any on-premises or cloud-based SAP systems with Amazon Simple Storage Service (Amazon S3) through this ABAP add-on with no additional hardware. Ricardo Casanovas, CTO & Co-Founder Linke / William Delcour, General Manager France. Join us to learn why SAP customers are moving their workloads to AWS cloud. We will show how AWS can help SAP customers to be more agile, respond to new business challenges and be more cost-effective on infrastructure and operation costs. We will walk through the different challenges that SAP customers face regarding the maintenance and evolution of their SAP landscapes - such as SAP HANA adoption and SAP S/4HANA migrations - and what AWS services and technologies are available today to help you address those challenges in a safe and cost-effective way. Ricardo Casanovas, CTO & Co-Founder Linke / Guillem Torres, Solution Architect and SAP expert. - Plan & Execute SAP Business workloads migrations on AWS. - Cover the routes on each scenario: OS/DB platform, database size, downtime window and connection bandwidth. - Impact of each variable on the overall migration project and combine all together to shape the right migration strategy to AWS. This is a technical webinar aimed for Infrastructure Engineers, SAP Basis and OS/DB migration experts and technical decision makers. Traditionally, setting up High Availability for SAP systems has been achieved through the implementation of third-party software tools, often expensive and complex to deploy. Today, customers can leverage AWS highly available cloud services to achieve High Availability for their SAP systems at a fraction of their cost. Learn how you can configure High Availability for SAP systems on Amazon Web Services using their own AWS tools and services such as Amazon Cloudwatch, AWS Lambda, and AWS Systems Manager. Enterprises worldwide are accelerating their migrations to the cloud. SAP workloads stand at the core of those leading businesses worldwide and AWS has proven to be the leading cloud provider, as reported by Gartner. One of the main challenges after migrating SAP systems to the cloud is to evolve SAP operations towards a fully automated environment to become more agile, cost-effective and competitive. Infrastructure Automation is at the heart of any cloud practice at scale. 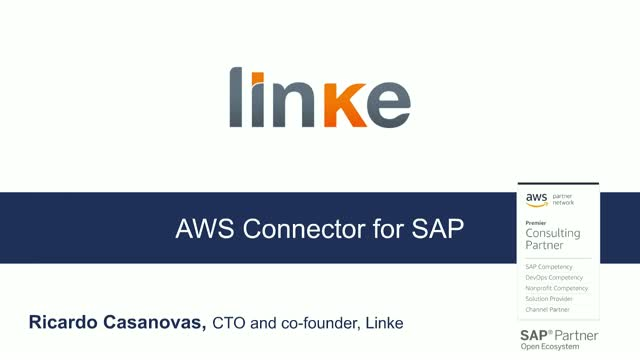 At Linke we believe that SAP workloads are no exception and that SAP infrastructure automation is the most important challenge for enterprises once they have migrated to the cloud. For this, we have developed our SAP infrastructure automation practice using Chef. • Accelerate SAP deployments from days to hours. • Industrialize SAP deployments in the cloud to reduce human errors. • Comply with audit regulations & enforce SAP workload security on AWS. • Make SAP workloads cloud friendly. Our webinars aim to provide tips, solutions and present our products to help migrate or make the most of SAP systems on AWS cloud. We want to spread the word on how we deliver bespoke cloud native solutions and end-to-end cloud journey from adoption to deployment and maintenance. Showing in a practical and technical way how to build a more robust, fast, automated, compliant, scalable and cost-effective solution on Amazon Web Services.